Hudsonian Godwit by Thomas B. Johnson. Report from Chile: Godwit Flocks Within Sight! Today’s post comes to us from near the tip of South America: Chiloé Island, Chile, where it is early summer. 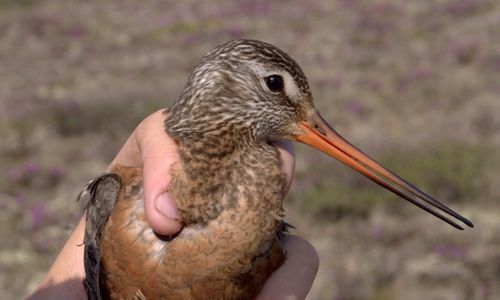 Graduate student Nathan Senner and a team of shorebird biologists are studying the enigmatic Hudsonian Godwit, a species that gathers by the thousands on its Arctic breeding sites and South American wintering grounds, but is virtually never seen in between. Nate and his colleagues are trying to figure out how they do that – and perhaps learn secrets to their conservation along the way. My godwit obsession began with a year spent following godwits on their migration from Arctic Canada to southern South America and back again – just me, my wife, and a couple of backpacks and some binoculars. 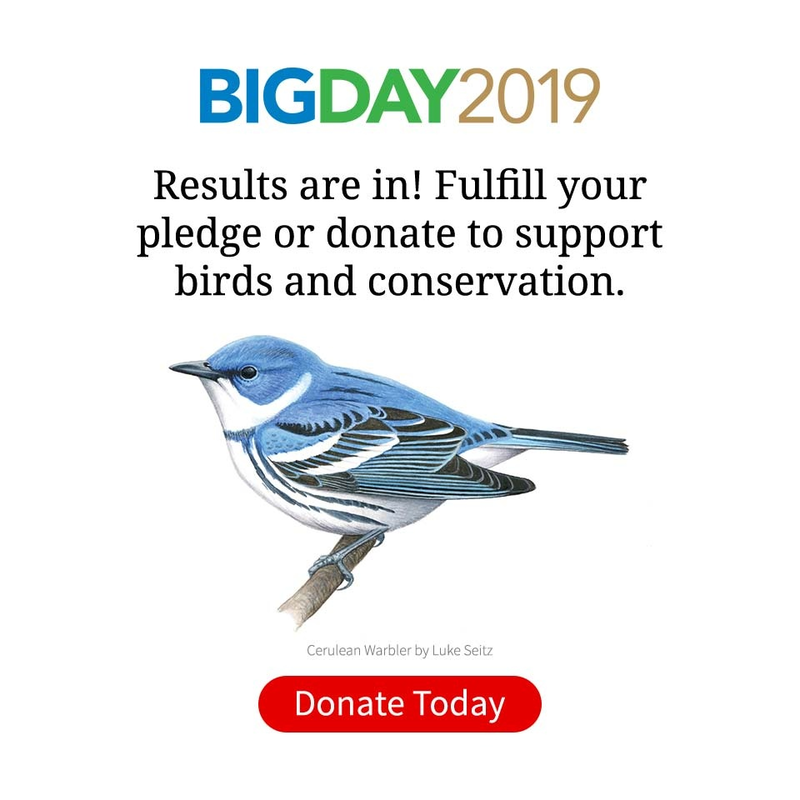 As quixotic as it sounds—two people trekking up and down the continent looking for a bird that few people ever see more than a couple of times—it was just crazy enough to get funded by a small fellowship, and off we went. Little did I know that I would become hooked for life! Now, after a couple of more field seasons on their Arctic breeding grounds and Patagonian wintering grounds, and with the aid of a bit larger operating budget, 10 of my colleagues and I are converging on Chiloé Island, off the coast of southern Chile, to capture and color-band enough godwits to begin to document their movements up and down the Western Hemisphere. Their somewhat peculiar name aside (my grandmother calls them “nitwits”), Hudsonian Godwits have for many years been a mysterious species for ornithologists and bird watchers. 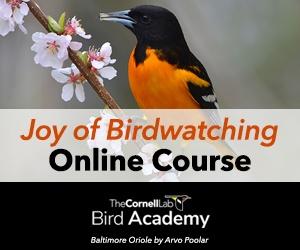 Their features are striking—long, slightly upturned bill, brick-red plumage, characteristic white rump and black tail—but their mystique lies in how little we know about their long-distance movements. Each spring, godwits depart from the southern tip of South America (including Isla Chiloé, Chile) and move northward, stopping sporadically along the Argentine and Chilean coasts before a final massing point at Lagoa de Peixe in southern Brazil. From there they go unseen or unnoticed, appearing occasionally at flooded agricultural fields and along the shores of reservoirs throughout the central U.S. and Canada before arriving at one of three separate breeding sites—Hudson Bay, the Mackenzie River Delta of northwestern Canada, and south-central and western Alaska. In fall their disappearing act is even more complete. Almost no one sees godwits on their way south except for a few stray sightings each fall in the northern U.S. Nine thousand kilometers later, they turn up in Argentina and Chile. Do they make that flight in one jump? Or is there some, as of yet unknown stopover site waiting to be discovered on a remote muddy island deep in the Amazon? Answering that question is what has brought me and my colleagues to Isla Chiloé for the next two weeks. With more than 15,000 godwits spread across 17 sites on the island, Chiloé is one of the easiest places to access godwits and one of the best places for us to capture large numbers of them. 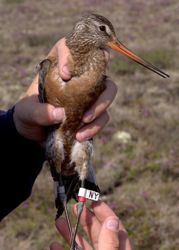 After we’ve safely color banded and released them (and using some other technologies with birds caught during the northern summer), we are hoping to finally identify just where it is that godwits go during their epic migration. Over the next two weeks I’ll keep you informed every few days on our progress in banding our goal of 300 new godwits and Whimbrels and in resighting some birds we’ve banded in years past. And if we’re really lucky, we’ll find some of the birds we banded just this past summer in northern Canada. It should be an exciting couple of weeks and hopefully they’ll entice all of you to become as excited about Hudsonian Godwits and their migration as I am.